I have posted a few stir-fry recipes on here, I know. But the thing is, whether you need a quick and easy weeknight meal or you're just trying to clean out the fridge, stir-fry is a fantastic go-to. Last week I was CRAVING Thai something fierce. We don't really have any Thai places around here so if you are craving it, you better be willing to go for a little drive or make it yourself. So, I decided to rummage through my fridge to see what I could come up with. I found carrots, red bell peppers, mushrooms, edameme, ladies and gents we have a stir-fry! 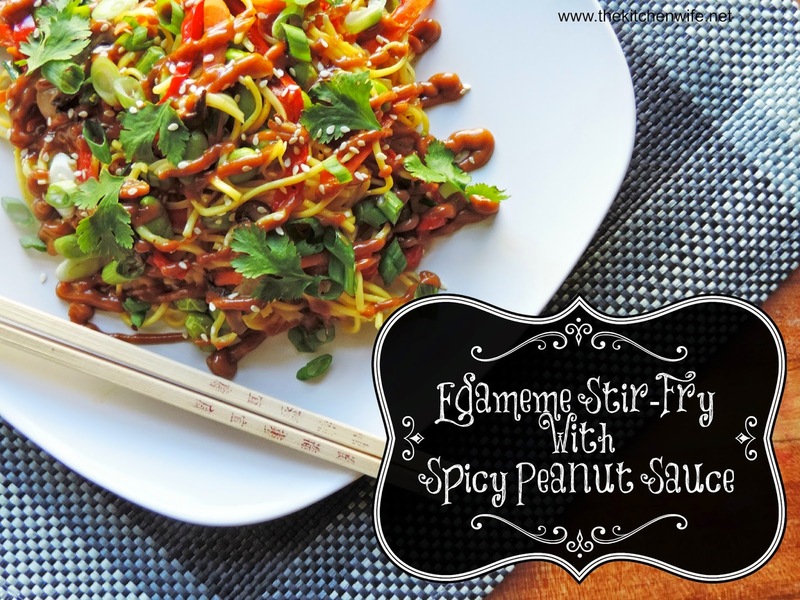 The star of this dish...The Spicy Peanut Sauce! It is out of this world and I KNOW you are going to love it! I have said this time and time again. When you are preparing any sort of stir-fry dish, well, any Asian dish in general, the key to success is in the preparation. Take a moment and chop all of the vegetables, mince your garlic, grate the ginger, pre-measure the liquids, etc. because this is going to go fast. You will also want to put a pot of water on to boil for the Chow Mein noodles. Next you are going to get the sauce ready. Combine the soy sauce, rice wine vinegar, brown sugar, peanut butter, garlic, ginger, and Sirracha in a bowl. Whisk them all together until smooth. This is a thick sauce. If you are going to put this into a squeeze bottle like I did, this is fine. If you are going to drizzle it over your stir-fry or add it to the stir-fry, I would add 2-3 tbsp. of water to thin it out a little. By this time the water should be boiling and you can add the noodles. Now place a deep skillet over a medium high heat and get it smokin' (and it will literally smoke) hot! Add the oil along with the carrots and peppers. Next add HALF of the scallions to the pan and cook for 1-2 minutes. They will cook for 3-4 minutes. Cook until they are heated through. 3-4 minutes. Now you can add the noodles to the pan and give everything a toss. Add the Stir-fry to the plate, drizzle with the spicy peanut sauce, and top with a few of the scallions, some sesame seeds, and cilantro. And there you have it! A healthy, flavorful, quick and easy meal that the entire family will love! Of course you can also add chicken to this if you would like, but trust me when I tell you that it is very filling as is. You won't even miss the meat. So give this amazing recipe a try tonight! You won't regret it! Prepare all of the vegetables, measure out the liquids and peanut butter, and bring a pot of water to a boil. Add the chow mein noodles to the water. Place a deep skillet over medium/high heat and let is get HOT. Add the carrots and red peppers. Cook 1-2 minutes. Add HALF of the scallions and cook 1-2 minutes. Add the mushrooms. Cook 3-4 minutes. Add the edameme and cook 3-4 minutes. Add the chow mein noodles and toss with the vegetables. 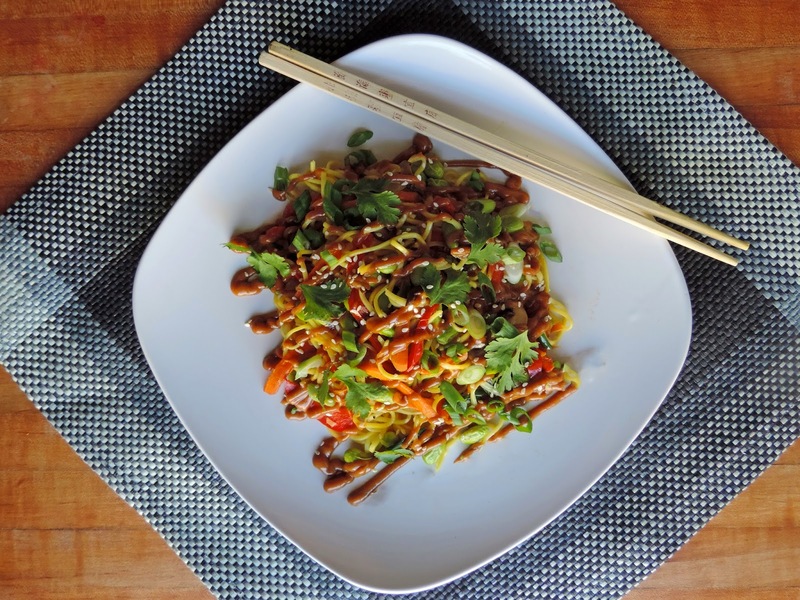 Plate the stir-fry, drizzle with peanut sauce, and top with the rest of the scallions, sesame seeds, and cilantro. *If the sauce it too thick add 2-3 tbsp of water to thin it out. **If you are going to add the sauce to the stir-fry itself, this is where you would do that.